For this year’s Media and Entertainment conference, in addition to setup and rehearsal days, each “presenting” company participated in a complete technical walk-through to ensure that all of their content worked correctly.efficient manner, and, using the ScreenPRO-II and DCS-100, we’ve got the right mix of multi-format equipment on hand in case some ‘interesting’ formats come along. The versatility of those boxes is very attractive to me, and having them available gives me a comfort factor — especially if the presenters throw any curve balls. At the conference, the general session’s unique look consisted of dual “floating” 16:9 AV Stumpfl screens with front fabrics, 1080p projection using 3-chip DLP Panasonic PT-DW10000 projectors, and seamless 1080p switching using a Barco ScreenPRO-II presentation switcher and MatrixPRO routers. 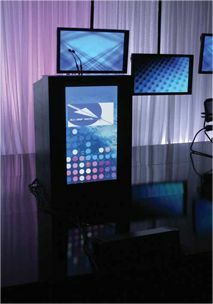 In addition to the two front projection screens, five 50-inch plasmas were used as on-stage thematic elements, three 42-inch plasmas functioned as individually routed downstage confidence monitors, and two 42-inch plasmas were vertically mounted in the custom- fabricated lecterns. Upstream switching for the on-stage plasmas consisted of Barco DCS-100 and ImagePRO HD systems. Backstage, the DMS (directors monitoring station) used dual 15- inch multi-format 1080p monitors with quad split capabilities, integrated work lights, and power conditioning for the director’s peripheral equipment. Overall, video equipment was supplied by Blu Laser Digital with additional support by Video Equipment Rentals (VER). In light of today’s budget squeeze, how does the AV provider truly succeed at downsizing a large event and maintain the level of quality and technical support that a client expects? If your first guess is to trim the equipment budget, trim the crew, and shorten the setup time, you’re way off base. In terms of sheer bottom-line economics, it was also clear that the second most important "efficiency" factor was to simply listen carefully. "The number one priority is the client's needs, and how to communicate their message for their intended audience," adds Sullivan. Another key factor comes into play, in terms of getting the most out of one’s equipment, crew, and budgetary requirements. Specifically, today’s clients are much more educated. Whether it’s because of the media, the advent of the internet, or the fact that high-quality AV equipment is readily available for the home or office, clients can easily learn about the latest technology, and easily grasp the pros and cons. "We start with the client's requests, we map that out on a workflow, and then we engineer our video system specifically for their needs. If the client doesn't need blended screens, but they do need PIPs, a ScreenPRO-II is an excellent solution. The larger systems are fine -- but for different client requirements that have a really cost-respective approach," adds Hamilton.